I should start by saying that I had to wait my turn to read the advanced review copy of this graphic novel, because a certain 13-year old wrestling fan I know divested me of it just after it arrived. A non-reader, J finished it in one sitting and really didn't want to take a break for dinner, even. High praise indeed. 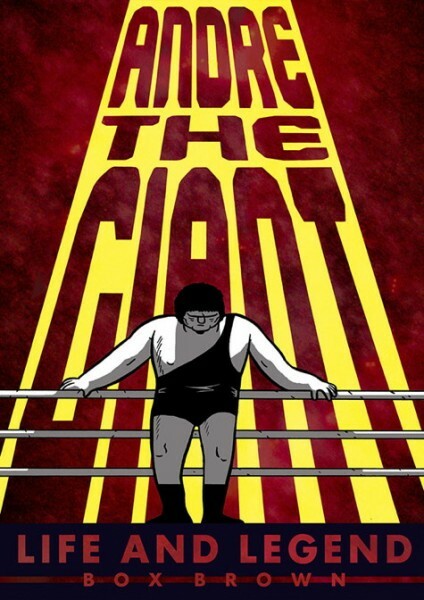 If you are a WWE wrestling fan, or seen the movie The Princess Bride, then you've probably heard of André the Giant. This graphic novel relates the story of his rise as a wrestler while dealing with debilitating physical issues. André never really stopped growing, thanks to the condition known as acromegaly, and he was told early on in his career that he'd be lucky to live to age 40. The book is an unsentimental look at André's life, including some of the less pleasant aspects of it: how he was picked on or taunted throughout his life, how difficult travel was for him, how much he ate and drank (hint: a lot), and how he was sometimes a great friend, and sometimes fell short. The book opens with an interview with Hulk Hogan, who became a superstar largely because André the Giant and Vince McMahon agreed to hand him that position. It then flashes back to an episode in André's childhood in France when he was 12, and the school bus driver refused to continue to carry him because he didn't fit well inside the bus. André caught a ride at least once in the back of a pickup truck driven by noted playwright, Samuel Beckett. André was a consummate professional when it came to professional wrestling, and did a great job selling both himself and the entertainment he was part of. He truly enjoyed his work on the movie The Princess Bride, filmed while he was recovering from back surgery. He told Mandy Patinkin it was because nobody looked at him funny on the set. This graphic novel is an unflinching look at the complexities of his life, and it is told using the actual language used by people at that time, including the N-word and a host of four-letter words. It is impossible not to feel empathy for André, just as it's impossible to like him all the time when you read this book. An excellent biography, and a great profile of a larger-than-life man. This graphic novel from First Second books is scheduled to release in just over a month, on May 6th. I just ordered this from my local comic shop. Can't wait to read it. I just ordered this from my local comic shop. I can't wait to read it. Kristopher: I think you're going to enjoy it, especially if you are a wrestling or André the Giant fan!